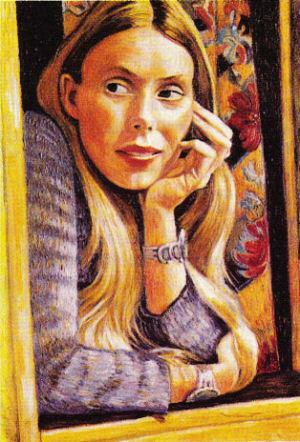 At 61, Joni Mitchell has no plans to write more music. For her legions of admirers — indeed devotees — across Canada and around the world, this is bad news. 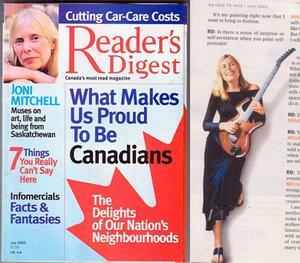 The good Joni is alive and well and very busy in her Los Angeles and Sechelt, B.C., homes, painting full-time and enjoying a period of reflection that includes rearranging and re-releasing her music. Her most recent CD, Songs of a Prairie Girl, has been released in celebration of the Saskatchewan centennial — Joni's contribution this year to the province and country of her roots. Born November 7, 1943, in Fort Macleod, Alta., Roberta Joan Anderson and her parents moved to Battleford, Sask., after World War II. The family moved to Saskatoon when Joni was nine. 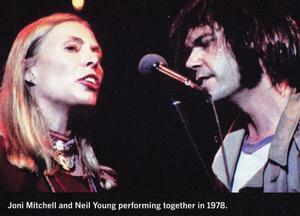 That year, Joni contracted polio, but though briefly paralyzed, she did regain the use of her legs. The experience, however, turned the otherwise healthy young girl towards the arts — painting and music. Going on to art college in Alberta upon graduation from high school, the young Joni became pregnant and gave birth to a daughter in 1965 - a daughter she was unable to care for and gave up for adoption. Later that year she moved to the United States to pursue her music. [Although she married twice, she had no other children.] Joni and her daughter were reunited in 1997, and today she is enjoying being a grandmother to Marlin and Daisy. Her music is legion and legend. 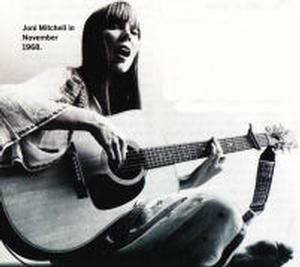 Since 1965 Joni has released 22 albums — Clouds, Blue, Dog Eat Dog, and Turbulent Indigo, to name but a few. In her more than 40 years as a respected and admired singer-songwriter, she has been awarded three Grammys, two Junos and a Gemini for Best Performance. In 1995 she was given Billboard's highest honour, the Century Award. In 1996 she shared the $150,000 Polar Music Prize awarded by the Royal Swedish Academy of Music [considered by many to be the Nobel Prize for music]. In the same year, she received the Governor General's Performing Arts Award and the National Academy of Songwriters Lifetime Achievement Award. In 1997 she was inducted into the Rock and Roll Hall of Fame. In 2004 she was awarded the Order of Canada. 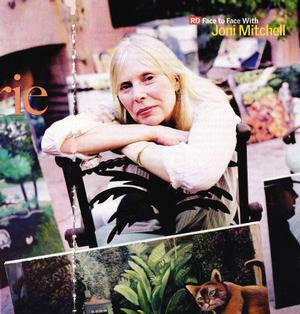 Joni rarely gives in-depth interviews, but in April she sat down with Reader's Digest at the Hotel Bel-Air in Los Angeles for more than three hours. She wanted to start in the afternoon because that's when she typically begins her day; she likes to paint through the night, "when I'm most creative." At turns relaxed and intense, her blue eyes flashed with life and there was much laughter. She is clearly comfortable in her skin and with where she is today. She spoke to us about her Prairie childhood, her feelings about yesterday's and today's music, the state of the world, growing old, romance and her painting. RD: You were familiar with this magazine as a child? Mitchell: I love Reader's Digest. I grew up on it, played "Word Power." In Grade 7, I wrote a poem and there were two over-sized words for an 11-year-old in it. "Saffron" I got from my mother and "equine" I got from "Word Power." I did all my book reviews as a teenager from Reader's Digest condensed books. RD: We won't go back and tell your Grade 7 teacher. RD: It seems that you have a great fondness for Saskatchewan. Mitchell: My years there were glorious, really. I loved growing up in Saskatchewan. 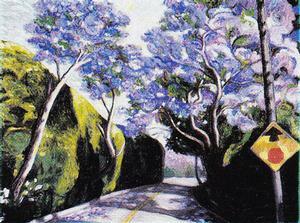 We always lived on the edge of small towns, so I had the luxury of riding my bicycle into the country, looking for beautiful places, which usually constituted a grove of trees. You know, I started smoking at age nine. I had a bad year when I was nine [with polio], and I was paralyzed. I prayed to get my legs back and kind of made a deal with something, I don't know what, my Christmas tree, God, Jesus. Then an opportunity arose to join a church choir, and I thought, That's the payback, so I joined it and I became a descant singer because nobody wanted to take that melody — I called it the pretty melody. Anyway, one of the little choir girls brought a pack of cigarettes to choir practice, and we all went out to the pond behind the United Church in North Battleford and passed them around. There was a lot of coughing and nausea, but I just took to it. For me, it was a grounding herb. I guess I will let it kill me — better it than something else. RD: You have said certain places there give you a sense of renewal when you go back. Mitchell: Yes, if I get out into the country — in spring, for instance, when the first crocuses pop up through the snow or when I find a beautiful place in a field, where birds fly in and out. And driving to my Uncle Lyle's — he had a farm south of Creelman — and seeing a hailstorm coming and knowing how devastating it can be because, up until recently, everything hinged on how the farmers did. So, it is still a province of skywatchers. RD: Your new CD, SONGS OF A PRAIRIE GIRL, coincides with the centennial of Saskatchewan. Where did that idea come from? Mitchell: Lynda Haverstock, the lieutenant-governor, wanted me to participate as a singer. Well, I've retired. So then she wanted me to be and emcee, and I thought, Well, you need a comic for that. So I talked Rhino Records into doing a limited edition of it [Songs of a Prairie Girl] to be given out as party favours at the gala. RD: How did you choose the songs for this CD to reflect Saskatchewan? Mitchell: I rounded up everything that had some mention of it. The list was longer than the CD would hold. Song For Sharon [was included] for Sharon Bell. Sharon was a childhood friend of mine from Maidstone who studied voice and was going to become a singer. I was always going to marry a farmer. She ended up marrying a farmer and I became a singer. Urge For Going is about the long, cold winters, and it's pretty much a soliloquy about Saskatchewan. RD: Did you find as you started to pull the songs together you did a little bit of crying inside for where you came from? I am, just listening to you. RD: You had fun doing it? Mitchell: I am enjoying this repackaging. [I'm] using this retirement as a time to reflect on my work and to organize it categorically. Rhino Records began with a record they wanted to call The Best of and I said, "You know, I am about to get my doctorate from McGill, and there isn't one song on your list that's getting me a doctorate in music. You can call this Boss's Choices, [but] Best of — in whose opinion?" The songs were the ones that the executives thought were common denominator enough to gamble on in the dog race of it all. But it was nowhere near my best work. RD: If you were doing this when you were 40...? Mitchell: I couldn't have done it when I was 40 because I was intolerant of my early work. The later work had been dismissed, which is the nature of the business. After record six, they try to kill you off, period. They groom for the new. I won a Grammy for Turbulent Indigo and the following day there was a newspaper article [about] singer-songwriters then and now, and I was in the "then" column, the day after winning the Grammy. We are just improperly educated about music. [I am] a long distance runner in a sprinter's business. It's a disposable culture. So this leg of [my career] is not something I knew existed. I thought I was really retired. As it turns out, I am working harder than ever, and there has been a reprise given to a lot of the later work, which was dismissed without any intelligent reason. When I wrote it, it was with intent to educate. Mitchell: [Big sigh] I am very critical of Western society. I think a fundamental error was made and the parts of the Western mind that atrophied were emotionality and sensitivity. So my work would be to give them [emotionality and sensitivity] their just due. The greatest compliment I can receive - a young man came up to me yesterday and said, "Thank you, you changed my life." I said, "Could you in a nutshell explain how?" He said, "Well, I was exposed to you at an early age, and you taught me how to feel." I thought, Okay, that's important, because in a court of law, "I know" counts, "I see" counts, "I feel" does not count and "I sense" does not count. So as a result, no true judgement can take place. RD: You said earlier, "I am not really sentimental," and now we are talking about the importance of feelings and emotions. How do you reconcile that? Mitchell: I think Mafia dons are sentimental. People who create great atrocities frequently are sentimental. RD: But sentimental can be charming. Mitchell: [Sings] "Going to take a sentimental journey..." I try not to look back much, [and] sentiment is kind of looking back. Right now, that is what I am doing. RD: You're revisiting the music in a very different way. It must have brought up a bit of emotion in you. Who you used to be. We all used to be someone. Mitchell: I don't know who I used to be. RD: I just wonder what it meant to you, inside you, as well as the gesture to where you come from, where you see your roots. Mitchell: Because we moved a lot, as a child, you couldn't let your roots go down too deep, otherwise pulling them up would be extremely painful. RD: You were born in Fort Macleod. Mitchell: Then we moved to Calgary, then we moved to Creelman, then we moved to Maidstone, then we moved to North Battleford, all before I was five. So because of all that gypsying — which was good experience for me — it made uprooting easier. As an artist in the pop arena, if you get a formula working, you stick to it. And they kill you off anyway, whether you change or not. But if you do change, you are going to lose an audience and hopefully gain another one. I watched Jimi Hendrix. [He] was at the end of his period and was trying to make it to the second period. He was humiliated by playing the guitar with his teeth and all the flashy things, and he tried to stop doing it, but the audience would say, "Jimi's not himself." And he was really having a hard time with the rejection that goes with going to your next period. He wanted to stand still, get a brass section, but he had banged into Miles [Davis] and Miles had banged into him. Miles plugged in his horn and started wearing patchwork velvet, and Jimi went the other way. RD: He had trouble pushing himself forward? Mitchell: He had trouble taking the rejection that goes with changing. For me, traveling around as a child, being uprooted, made it easier to take loss and rejection. Every time I changed, I would receive a lot of rejection. Mitchell: ...It had to be done. They were going to get you for staying the same, and they were going to get you for changing. So of the two, changing was more interesting. In that way, I am not sentimental. It's easy for me to move. I had lived in my house here since 1974. But during that time I have also lived part-time in New York. I have a place in British Columbia I get to in the summer. That could be my roots. I tend to be like a drifting air plant. RD: What are you reading now? Mitchell: I like Kipling a lot. I think the wisest line in all of literature, including the Bible, is Rudyard Kipling's monkey. "We are the most wonderful people in all the Jungle! We all say so, and so it must be true." There is nothing more pertinent than Rudyard Kipling's monkey at this time in our history. RD: Can you expand on that? Mitchell: Really? Okay, ethnocentricity. You hear it everywhere you go: My people are the most wonderful people in the jungle. My people have always said so. That is what war is about. RD: Do you read modern novels? Mitchell: No. I read dry books: theology, philosophy. RD: Does it come from your mom? Does it come from your dad? What about your grandparents? Mitchell: I think it comes from the Irish side of the family. Definitely I think it is blarney. RD: When you say blarney, you don't mean it in a derogatory sense? Mitchell: I mean it in a mischievous sense. I think some nights the blarney is running and some nights it isn't. I was born with a gift of metaphor. I would say all the arts stem from a gift of metaphor. RD: What's the other blood in you? Mitchell: My father is Norwegian and Sami, although because of the native tension in the region, he won't cop to that. But, yes, there is Sami. Mitchell: I knew my grandmothers. RD: Do you feel any connection there? Mitchell: Not my paternal grandmother. She had so many children and so many grandchildren, she spoke to me only once. We were in the mountains in British Columbia - where she was living - and there was a thunderstorm and I was scared. I was about three, and she said, "Oh don't worry. It's only God dragging his buckboard through the sky." RD: Are you good friends with your parents? Mitchell: Yeah, I stay in touch with them. They'll be 94 this year. We have our differences. My mother and I have had a lot of friction. She always said I was too emotional and thought too much and was too sensitive. I was always too something, you know. But I think she was a good guide in a lot of ways. We've made our peace. RD: What about your dad? Mitchell: My dad was aloof. We were closer in my early childhood than we were in my adulthood. He is three quarters underwater. He's Scandinavian, and he doesn't talk a lot. The things he says when he does speak — you are not sure if you have been insulted or flattered. RD: When you were at art college [in Alberta], did you have something in mind before you started? Mitchell: From Grade 2 in school, I forged an image of myself as an artist. I just always knew. That was my identity. RD: Do you know why? Mitchell: I'm a boomer. The school was spilling over, so they dragged an old lady out of retirement and annexed the parish hall as an extra school. She was a well-meaning old gal. But she tested us, and when the results came back, she rearranged us in the room. She took the kids who had averaged A and put them in a row and called them the Bluebirds. She took the kids who had averaged B and put them in a row and called them the Robins. And she took the C's and put them in a row and called them the Wrens. The flunkies, she called the Crows. I had just been designated a third-class citizen. I was in the C row, and I liked some of the kids in the D row: they were sensitive and uncooperative in a way, but they were interesting if you could open them up. So, I looked around and I saw the A students, ever so smug about their victory, and I didn't like any kid in that row. I can't remember the exact language that I had in my head, but the gist of it was this, All they did was she said some things to us and they said it back and then they got to sit in this row. They looked all full of themselves. Well, I didn't want to sit in that row. I took one look and I thought, But I draw a doghouse in perspective, and everyone else's was tall and skinny or inverted perspective, and at that moment — because I had just been called average — I forged this specialty in my mind: I drew the best doghouse. RD: What an irony - a doghouse. Mitchell: I'm a pictorial thinker. I would pay attention for maybe the first two weeks of school and my notes would be real orderly and illustrated and nice, and then it would just disintegrate into fashion and poetry. RD: Early on you knew what you wanted to be? Mitchell: I had a column in high school called Fads and Fashions and from [age] 12 to 16, I manipulated fashion in a way. Kids used to copy me and I didn't like it. They would wait until I bought my winter coat and then they would get the same one. I have a nose for forecasting. But I worked that out of my system, which was very good preparation for the music business, because it's manipulated. It's in and it's out. And you really don't want that interfering with serious work. You want to create things that are classic. When I was working with [Charles] Mingus, he told me, "Don't deviate from my melody, no interpretation." So in one song called "Sweet Sucker Dance", I changed one note and he said to me, "You changed my note". I said, "Well, I wanted it to go up here as it goes into the bridge because it goes better with the text to have the inflection go up instead of..." "But you sing in the square note", he said to me. I said, "Well, Charles, that note's been square so long it's hip again". So he said to me, "Okay motherf*****, then you sing your note and my note and you throw in a grace note for God". I don't know if you can put this in your magazine. RD: We'll work on that. RD: What made you want to make music? Mitchell: I was inspired by a piece by Rachmaninoff that I [heard] in the movies. I would go down to the store and take it out of the jacket and listen to it in the listening room. I'd dream that I could drive a car and I could play the piano beautifully. Those were the dreams I had. One day [my piano teacher] rapped my knuckles with the ruler, saying, "Oh why would you want to play by ear", whack, "when you could have the masters under your fingertips?" So I quit piano lessons. That kind of brutality drove my love of music underground until I was 18, when I picked up a stringed instrument. RD: Different place and time. Mitchell: I was outside the box, completely, from the culture I was being raised in. RD: Did your parents understand you? RD: Do you admire any Canadian female singers today? Do any of them remind you of yourself? Mitchell: No, I wasn't that crazy about the music of my generation and less so of the generations that have come since. It began to degenerate with my generation. Our generation seemed to be so amateur. Frank Sinatra used to call us the bums. I was on his label and they were making money off us, but it was a big step own in a lot of ways from the musicality and the wit of the writers that came before. I am really a swing-era person. RD: You enjoyed the female singers of the 1940s and '50s? Mitchell: Not all of them. I am a poet who doesn't like much poetry. I'm a musician who doesn't like much music, and I am a painter who loves painting. I love so many paintings, and I know so much more about it than I do about music or poetry. But I'm not original. I love too much, so it's harder to synthesize. RD: You don't feel that need with your art? Mitchell: Oh, I do. It's hard to find a path untaken, whereas I have an original voice as a poet and I make original music. If I analyze it [pop music], it's a dime a dozen. From singers, I demand something - and even from myself - a nearly impossible emotional sincerity; or, on the other hand, a wry facetiousness. RD: You've used the phrase "woman as doormat" songs. Mitchell: A lot of the texts were written by men for women to sing, and they were perpetrating the white picket fence hoax just as feminists perpetrated the woman in the workplace hoax. RD: You are not a feminist? Mitchell: No. I am very domestic by nature - cook and decorate. Mitchell: I don't like to be put on a pedestal. I like a meeting of minds. I love men's company, and I have enjoyed, since early childhood, a kind of honorary maleship, although there were places where they would turn on me: "You can't do that because you are a girl". I played cowboys all the time [growing up]. And they would never let me be Roy Rogers. Eventually I got a Roy Rogers shirt and a Roy Rogers hat and came out and said, "Can I be Roy Rogers?" "No you can't." "Look, it says Roy Rogers here!" They said, "Well, that means you're Dale Evans 'cause you're wearing Roy's clothes." "Well, what does Dale do?" "Well, she stays home and cooks." In spite of this, I am still not a feminist. RD: Who were your early female singing influences? Mitchell: When I first started out, I imitated a girl named Shelby Flint, as a novice singer. She had no vibrato, it was a very girly, breathy voice, easy to mimic. And then a little Joan Baez influence, but I don't care for Joan Baez. She's got a cold tone. She's chilly. She's not a soulful singer. I tend to like black singers. As a singer, I learned more from Miles Davis than I learned from anybody. RD: I read somewhere that you consider your [early] song "Both Sides Now" a failure and "California" and "A Case of You" as just ditties. Mitchell: I was so dismissive [because] those are what I [call] boss's choices. There was a certain amount of pressure on me to create hits, because that is where the money was. So, facetiously I created the song You Turn Me On, I'm A Radio. The tongue was firmly planted in the cheek. It was my idea of a hit. I loved the hit parade when I was a teenager, but by the time I was in my 20s, I had kind of out-grown it. We're in this prolonged adolescence. There are no more adults. We just don't come to maturity, and I blame rock and roll for feeding this prolonged adolescence. RD: Do you think there is anything right with today's music? Mitchell: I am sure there is, but I don't know. RD: You can't find it. Mitchell: I can't find it, but I'm in a rarefied position. RD: Have you ever watched American Idol or Canadian Idol? Mitchell: I watched a couple of [episodes] because my friends watch them. I find it unbearable. RD: Do you think it makes kids any more discerning when it comes to music? Mitchell: No. To be an artist, you have to know when you fail, and you have to know why. None of these kids competing are artists. They are deluded. They don't have the ability to be self-critical, which an artist needs. You have to be able to adjudicate yourself. RD: You've been called the most influential female artist of the 20th century. How do you feel about that? Mitchell: That's somebody's opinion. It is not for me to say, is it? RD: But how do you react to it? Mitchell: I get a trickle of feedback of my influence on the street. How extensive it is, I don't know. I can tell you this: I sell [fewer] records than any singer-songwriter - any female singer you can name - so either people are taping or they are passing on their record collection to their children. Jewel sells 15 million records. I sell 500,000. From my perspective, my influence is negligible. RD: Is there someone in this world, alive, that you wholeheartedly admire? RD: Anyone from history you would like to have met? Mitchell: I would like to have met Nietzsche. I would have liked to have met Picasso. I think I would have been a good friend to Van Gogh, who needed a friend desperately. No one in the later generations. I don't think mine was a very interesting generation, in general. Jimi Hendrix I loved, you know. I got to know him a little bit. No, we weren't a great generation, and our children are a less great generation. I don't see any greatness in my generation. RD: Are you willing to talk about your current boyfriend? Mitchell. I don't have one. RD: So at the moment you're single? Mitchell: Yes, but I have a really good group of male friends. I call them my three husbands. They have been my best friends for many years. RD: Who is your best girlfriend? Mitchell: I have several girlfriends; I don't have a best. One of my girlfriends said to me, "Joan, you know, either you are a fan of you or you hate you." You know, my cousins say, "Well, why did you get all the talent and we didn't get any?" I mean, I'm compulsively creative, so it's difficult, I think. It's come down to two cats and a dog. My cats are getting old, one died a few weeks ago and one died a couple of years ago. And I am an only child and happy with that. I tend to think a lot and need a lot of solitude. All I need are a couple of social outings a week at my age, and the rest of the time I'm quite happy either painting or writing. Debbie Green and I have become really good friends over the years. She was from Detroit, a friend of Chuck Mitchell [where I get my Mitchell moniker]. Debbie Green was a folk singer. In Berkley she taught Joan Baez how to sing and play the guitar. So Joan Baez, when she sings, she plays Debbie Green. She's not herself onstage.She has taken Debbie's persona. Debbie in her passive way gave up and let Joan have it. Joan kind of stole her soul and impersonated it. I am lucky; I have old friends. I did not fare so well with my old friends back home. There's that tall poppy thing there — it was kind of a funny thing, generally speaking, back home. It's a weird resentment. It happens, unfortunately, again and again, and it's not a credit to the Prairie character. There is a pettiness out there. RD: Do you ever still get the urge to "wreck your stockings in some jukebox dive"? Mitchell: Oh, yeah. It's been a while since we went to a dance hall, my friends and I. I guess the last one was Celia Cruz, and she died this last year. We went to Palm Desert, and Celia was in her 70s and she stood up and danced all night. And to the Apollo Theatre. I went to the Apollo Theatre once to see James Brown. And there were people there of all ages, and they were bursting from their seats...grannies, get the motion and stand up and dance. These days I am retired but working so hard that my excursions are more local. RD: Would you love again? Mitchell: Ah, no, romantic love has become transparent to me. It's like a ruse - it's a trick of nature. In the smitten period the estrogen levels go up in the male, so he becomes tender, and the testosterone levels go up in the female, so she becomes sexually aggressive. Romantic love is totally unstable and it depends on insecurity to keep it fuelled. Do I want to go through those exhausting games? Do I have the energy? No. RD: Does that mean you are immune to it? Mitchell: Who knows? You can't rule it out, but I am 61 years old and I heard it in an old movie: Women under 18 are protected by law, women over 60 are protected by nature. [Laughs.] It would take quite a man, I guess, to find me attractive, it's difficult for any man to live with me because they are subject to the Mr. Mitchell thing. He'd have to be tremendously secure and accomplished. And I have a tendency to learn by osmosis, so I will equal him in no time. RD: Does old age frighten you? Mitchell: It's natural. You know, I like this leg of my journey. 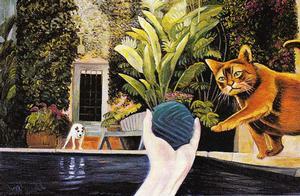 When I retired, I thought, Well, I will just paint. But instead, it developed into this reflective period, a reviewing of the work. RD: We talked a bit about feminism. Do you have a gift or advice to give your granddaughter? Mitchell: My granddaughter is beyond advice. This is the most independent creature. She was born that way. She's got a lot of rhythm and dancing. I said to her, "How would you like some dance lessons?" She said, "I don't need dance lessons. I am already a good dancer." Daisy is kind of on her own — and wants it that way. She has her tender moments [although she] she is independent. Mitchell: Marlin and I — he's the best playmate I've ever had. As a child, I didn't have people I could play with very well — where there was a good rally. I would end up playing by myself with them looking at me. My father thinks Marlin has the makings of a great man. My daughter once said [of Marlin's father], "It's a wonder he doesn't give me bad dreams." Marlin tugged on her shoulder and said, "But, Mama, bad dreams are good in the great plan." So I said to him, "How do you know that at three years old? It took me till 40-something to figure that one out." RD: What did he mean? Mitchell: It's one of the wisest things I ever heard said. It makes you believe in reincarnation. I mean he came into this world with a wisdom that belies his years. Whether he will maintain it...? It is not a wise culture. RD: Why have you continued to live in the West? Mitchell: I don't know. I have good friends here. I think that is the main reason. Old friends are gold. RD: If there were one thing you could do differently in your life, what would it be? Mitchell: In other words, do I have nay regrets? Well, bad dreams are good in the great plan. Anything that you might regret, sooner or later there is an opportunity that arises out of it for growth. It may not be instant karma. It may take 20 years. Like polio. I would have been an athlete. I probably wouldn't have been an artist. 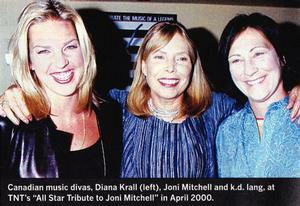 The Joni Mitchell thing wouldn't have happened. Mitchell: I did, briefly. I didn't get involved for years, and then I went on [Bob Dylan's] Rolling Thunder [tour] and they asked me how I wanted to be paid, and [it was like] I ran away to join the circus: Clowns used to get paid in wine - pay me in cocaine because everybody was strung out on cocaine. It was [Tibetan Buddhist spiritual master] Chögyam Trungpa who snapped me out of it just before Easter in 1976. He asked me, "Do you believe in God?" I said, "Yes, here's my god and here is my prayer," and I took out the cocaine and took a hit in front of him. So I was very, very rude in the presence of a spiritual master. RD: And he was able to...? Mitchell: His nostrils began to flare like bellows, and he [began] a rhythmic breathing. I remember thinking, What's with his nose? It was almost hypnotic. They have a technique called emanating grace ways. I assume he went into a breathing technique and a meditation. I left his office and for three days I was in [an] awakened state. The technique completely silenced that thing, the loud, little noisy radio station that stands between you and the great mind. RD: And when you came out of that awakened state...? Mitchell: The thing that brought me out of the state was my first "I" thought. For three days I had no sense of self, no self-consciousness; my mind was back in Eden, the mind before the Fall. It was simple-minded, blessedly simple-minded. And then the "I" came back, and the first thought I had was, Oh, my god. He enlightened me. Boom. Back to normal - or what we call normal but they call insanity. RD: It was his breathing technique and he managed to pass it on to you. And when you came out of your three days, you were no longer [using] cocaine? Mitchell: Yes. Ten years later when I learned he was dying, I went back to thank him. RD: You said once that you had pulled the weeds out of your soul when they were young, when they were sprouting, otherwise they would choke you. Did you get all your weeds out? Mitchell: No, no. [Laughs.] Do you want to know what I am struggling with? Mitchell: Well, emotionality. I've got an Irish temper. I have an artistic temperament. So, I am still a work in progress. RD: Where do you hope to be at the end of your 60s? Mitchell: I'm a good painter. I am trying to be a great painter. My subject matter is fairly simple: people I know, landscapes I love and, you know, things around me, very personal. I think you have to be a Catholic to be a surrealist. You need early training in that kind of imagination. All the great surrealists were Catholics. I have tried a hand at it, like painting my dreams and things. I am building a vocabulary to attempt that kind of personal work. It's my painting right now that I want to bring to fruition. RD: Is there a sense of surprise or self-revelation when you paint self-portraits? Mitchell: No. It's no different to do a self-portrait than any other portrait. I like to paint landscapes, they are freer. But from time to time, as a discipline, I will go into portraits. It's like pool. It's a lot of little abstract angles, and if you get them right... It's easier actually to do it from me. It is easier for me to sacrifice myself. Whether it is an attractive portrait or not doesn't really matter. I do self-portraits because the record company insists that your picture on the cover sells more records. You have got this space to decorate and I'm the one to do it. RD: Did you have a painting teacher? RD: You don't sell your paintings? Mitchell: I have. I sold them in Japan to make money to do some videos. I sold a lot. and I regret I did because when I have an exhibition now, they are missing links. RD: Do you paint mostly in the evenings? Mitchell: I paint all night, under the wrong light. But the night is quiet and everything shuts down, so night is a creative time for me. I am nocturnal by nature. So is my mother. We are all cats, maybe, of some kind. [But also] I had a lot of stalkers in my youth. I had dangerous lunatics in my yard, sometimes with machetes in violin cases. A lot of crazed [people] who wanted to marry me or murder me, so sometimes I lived under armed guard, being the night watchman. I've lived a dangerous life. Many of us have been killed, you know, John Lennon... It's a dangerous job in many ways because it is so intimate, and you don't know how the words will fall into a disturbed mind. RD: When you paint, do you listen to music? Mitchell: No. I've come to hate music. I don't listen to my own music either. I'm doing these [CDs] with a purpose. I only listen to it because I am working with it, and when I am done, when it's complete, I don't listen to it again. RD: Your early music is very well-known and then you went through a period of releasing albums that weren't as well received. Did that upset you? Mitchell: It upset me all the way. I just watched as the industry standards got lower and lower. The sediment rose to the top, and crap was being elevated — more formulated, less sincere. It's all very typical of a culture in decline. RD: So that period was hurtful? Mitchell: Yeah, but no more hurtful than what Van Gogh and Gauguin went through. There is room for improvement in the music, and in some ways, I regret I lost my ability to write it. If I had continued with my education and become fluent in writing music, I think I would probably be scoring. I would be doing more orchestral composition. Not so much symphonies — because they are all in one key and I can't stay in one key in one song — it would be more like ballets or nocturnes, more o the modern forms that are less defined, more pictorial. RD: What did receiving the Order of Canada mean to you? Mitchell: It's a beautiful award. But my two highest honours came from black people. In the green room at the Grammys, the door flew open and in came this black girl. She threw her arms out at said, "Girl, you make me see pictures in my head. Give me a hug." Now that's an honour. The other one was a blind black piano player named Henry Butler who said to me, "You make raceless, genderless music." RD: What difference do you see between Canadians and Americans? Mitchell: Canadians are caught between the Queen and Yankee Doodle Dandy. That is the Canadian chip - a national inferiority complex which is unnecessary. An inferiority complex can turn into delusions of grandeur. RD: Are the differences between Canadians and Americans becoming greater? Mitchell: Up until this [U.S.] government, I didn't see that much difference. I would argue with Canadians who attacked Americans. I would say, "They are not as different as you think they are." But in view of the last to elections, I see a great difference. Never was America so internationally hated, and rightfully so. With this government, my opinion of Americans has dropped considerably. The irony that they could vote this government in on a moral vote — the stupidity, the horror of that. How void of morality can you be to think this is a moral president? RD: Talking about different places, if you had to choose one place to live out your life, where would that be? Mitchell: Well, I always thought I'd like to live in Santa Fe. New Mexico during my 20s and 30s was a wonderful place. It's changed a lot. The same thing is happening where I am in British Columbia. When I moved up there [to Sechelt in 1971], it was a lot of poor weekend fishermen, poor people, and now it's being taken over. The millionaires came and then the billionaires came. RD: Do you have another choice? Mitchell: I guess I'll stick with what I know. Sechelt is my place, a spiritual sanctuary. RD: I was driving from Tofino to Port Alberni [B.C. ], after doing my research for this interview. I was driving back through Cathedral Grove. There is a park with huge Douglas firs. It has been conserved as a provincial park. There we were, driving on a very rainy day, and up in one of the trees was a handmade sign saying, pave paradise, put up a paid parking lot. And I had your music running through my mind, because you were on my mind, and there was this phrase from your writing. And I just wonder, how can you stop creating that? Mitchell: Because I am so disturbed because the world is so disturbed now. I am like a canary in the coal mine. RD: Yet you seem happy right now. Mitchell: I'm happy one day and I'm unhappy the next. The world gets to be too much with me. I take the world on my shoulders, the whole goddamn thing, sometimes, which is not a natural thing to do. But with me it is kind of reflexive because it has been my job for so long to reflect on the world. RD: Is there any hope? Mitchell: Of writing? Or any hope for the world? RD: You don't do any songwriting at all? Mitchell: I haven't since '97. RD: I don't know your painting well. For me, it's your music and your songs, and I wonder how you can retire from that huge part of yourself? Mitchell: Easy. It's just like a wind that blew through me, that stopped blowing. It's gone. RD: You have said you probably wouldn't write music again unless there was a "shift in you." What kind of shift would that take? Mitchell: It would have to be to reach another spiritual level. All that is in me right now is outrage and social criticism, and I have done that. So to raise my heart in song, I would have to have a kind of spiritual breakthrough. RD: Do you see that happening? Mitchell: It is not something you can push or foresee. This article has been viewed 29,882 times since being added on July 5, 2005.